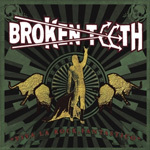 Texas rockers Broken Teeth, fronted by principal and lead vocalist Jason McMaster, return with their fifth record Viva la Rock, Fantastico! As usual Broken Teeth mixes the swagger of Australian rock and the Sunset Strip with lesser amounts of Texas boogie. Where Airbourne sound like something between a 21st century homage and simple Huxley clones, Broken Teeth ventures beyond stereotypes to add welcome creative nuances, but they're very subtle. Yes, similarities remain to that formidable band from down under, and Broken Teeth's songs are more like Photoshopped revisions. Listening to Blackheart, Splittin' Nails, or Twister reveals a more beer-soaked Austin roadhouse sound than a 'walkabout' in the dusty outback. Only on the title track does Broken Teeth truly divest themselves of AC/DC. May real wish is that they would add some positive Lone Star tradition by incorporating some real Texas blues and boogie (ala ZZ Top). But this might be asking too much from them, although I believe they could pull it off. Nevertheless, Viva la Rock, Fantastico! is all rowdy rock and roll mayhem. Unfortunately, it runs together just like Airbourne's No Guts, No Glory. McMaster's raspy Bon Scott vocals get old real fast. He has no depth or variation and, if you're not careful, it affects the measure of the music. Yet, Broken Teeth's Viva la Rock, Fantastico! is whiskey swilling, pick a fit if you dare, below the belt, and in your face hard rock: simple to understand, and easy to enjoy after a shot or two of Jack and a beer chaser. Broken Teeth's Viva la Rock, Fantastico! is whiskey swilling, pick a fit if you dare, below the belt, and in your face hard rock: simple to understand, and easy to enjoy after a shot or two of Jack and a beer chaser.